After the holidays, most of us are craving healthier options. 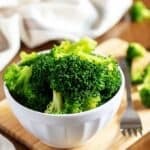 Why not try a steamed broccoli recipe? Lightly seasoned broccoli made in less than 15-minutes. Whew, I don’t know about everyone else, but I packed on a few pounds over the last three months. The time has come to try and get myself back on a healthier diet. That means more vegetables and less meats laden with fat. Keeping that in mind, we decided to share one of the easiest and most simple ways to prepare a healthy side dish. Our steamed broccoli recipe, made in a pressure cooker, is probably one of the least time consuming dishes you’ll ever create. Best of all, you can feel good about what you’re eating. I mean, come on, it doesn’t get much healthier than steamed vegetables. Well, I suppose you could eat them raw, that’s probably better. However, in our household, we have to lightly cook for vegetables, due to my health condition. In other words, I can’t eat raw veggies without having digestive issues. Fortunately, having an Instant Pot makes softening vegetables a breeze. 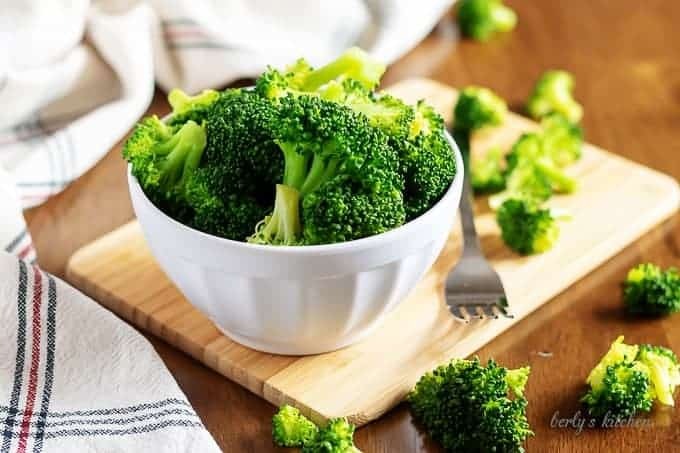 If you’re still wondering why we shared a steamed broccoli recipe and not our usual, “not so healthy dishes,” there is another reason. 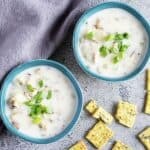 Recently, Kim put out some surveys on social media, by and large, people were asking for, “healthier options for their Instant Pot.” So, hopefully, this little side dish will give them something to work with for this week. How about we get started? First of all, there’s not a whole lot I can say about making steamed broccoli, so this will be short and sweet. Now, gather up your broccoli florets, salt and pepper, and water. Next, wash the broccoli and pour the water into your pressure cooker liner. After that, place your steamer basket on top of the water and drop the florets into the basket. Go ahead and season them with salt and pepper if you wish. Then close the pressure cooker lid and set the valve to sealing. Once your cooker is sealed, use the manual or pressure cook button and set it to zero (0) cook time. 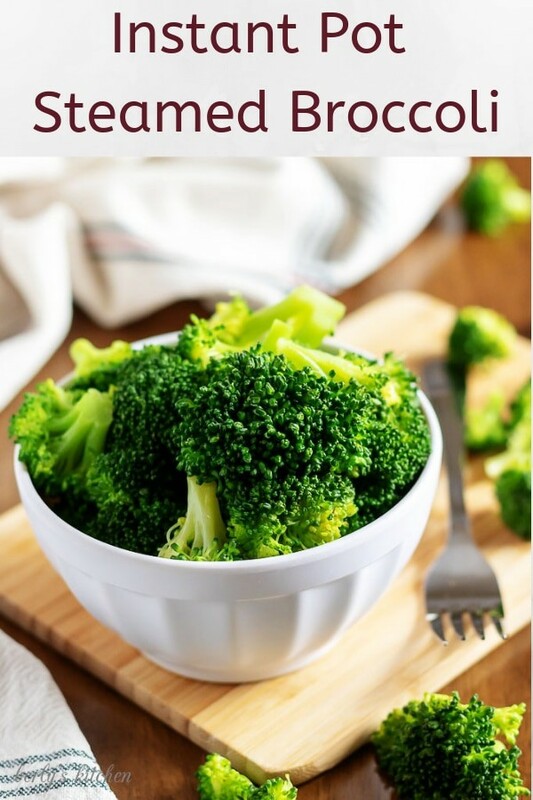 That sounds strange, I know, but trust me, if you want broccoli that still has a little crunch to it, then this is the correct course of action. With the cook time set to zero (0), let the cooker come to pressure. When it beeps, that’s it the steamed broccoli recipe is done. Last, complete a quick release by setting the valve to, “unseal,” remove the lid, and serve the broccoli while it’s hot. Done and done! If you’re wondering, how do I make steamed broccoli without a steamer? It’s not as hard as you think, but it will take some improvising. 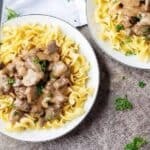 First, don’t use an Instant Pot, use a large saucepan over high heat. Fill it with water until it’s about 1/2 to 2/3 full. 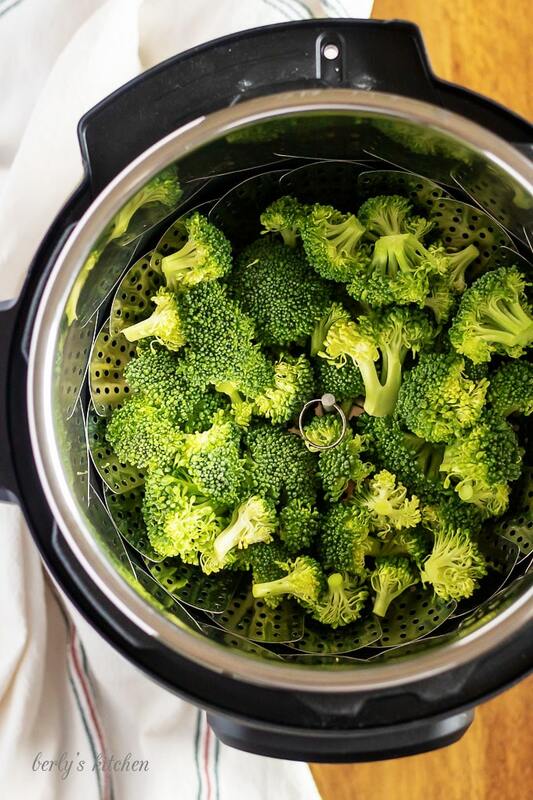 Prep your broccoli florets, then use a metal colander or strainer as your steamer basket. Drop the broccoli into the strainer, then balance the strainer over the steam from the boiling water. Afterward, cover the pan (strainer and all) with a lid and let the broccoli steam for about 7 to 10-minutes. It’s not the most elegant way of doing things, but hey, it works. Let’s face it, steamed veggies are pretty bland without proper seasoning. 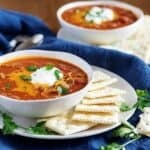 Here’s a few ideas you can use to spice things up. Try squeezing fresh lemon juice and a dash of sea salt over your florets before you cook them. You can also steam broccoli and garlic together for added flavor. Another option is to make a quick vinaigrette by combining salt, pepper, balsamic vinegar and olive oil; then, drizzle the dressing over the cooked broccoli. I wouldn’t recommend using a frozen broccoli for this recipe. Most of the frozen vegetables you’ll find at the store have already been precooked in some way during processing. It might work, but, I’m skeptical of the final product. If you like this steamed broccoli recipe, please leave us a comment and rate the recipe card. You can also find us on Facebook, Pinterest, Twitter and Instagram searching for Berly’s Kitchen! Wash and dry broccoli florets. 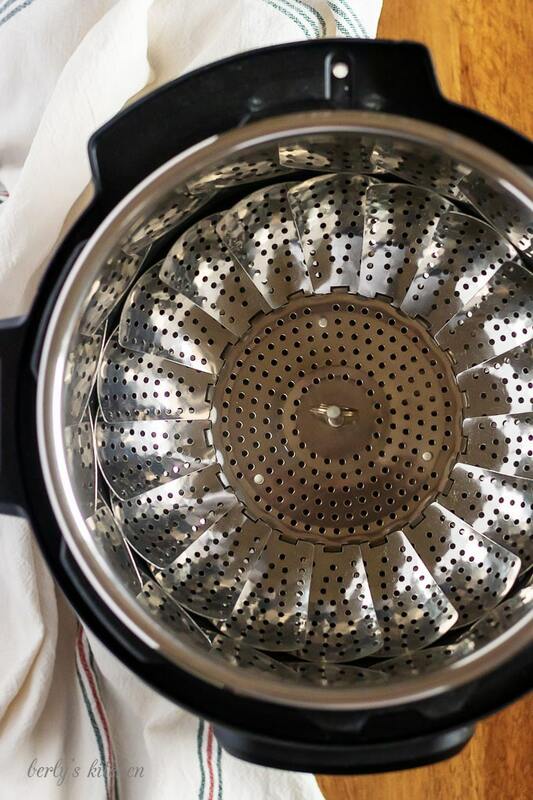 Pour water into the Instant Pot, and place steamer basket on top of water. Place broccoli florets into steamer basket and season with salt and pepper if desired. Close the lid and set valve to sealing. 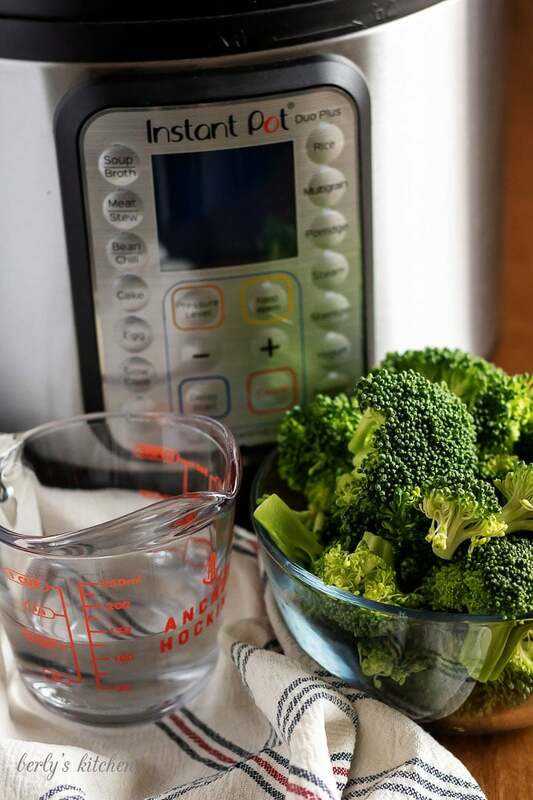 Use the manual (pressure cook) button to adjust the time to 0 minutes for crunchy/firm broccoli or 1 minute for softer broccoli. After the time is up, open the valve for a quick release of pressure. Remove the lid and serve immediately. The calories listed are an approximation based on the ingredients and a serving size of 1/2-cup. Actual calories will vary. 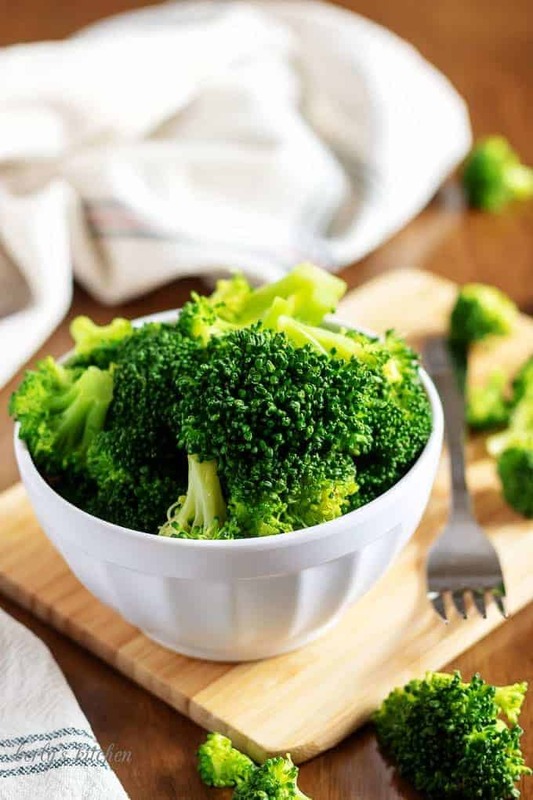 The steamed broccoli can be stored in your fridge, in a sealed container, for up to 3-days.